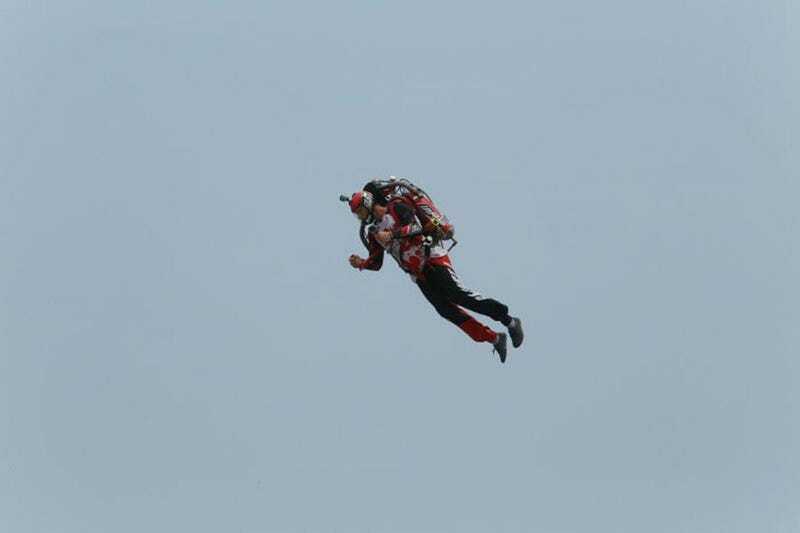 Professional daredevil Nick Macomber made history over the weekend, conducting the first successful jetpack flight ever in China. But don’t get your hopes up about taking one of these things to work anytime soon. According to China Daily, over 1,000 people watched in Beijing as Macomber blasted off to a height of about 10 stories, circled around a bit, and landed safely. The entire flight lasted just 27 seconds, a limitation of the jetpack technology which requires a tremendous amount of fuel to obtain lift. You can watch video of the historic flight below. “I’m like a bird, I just see where I want to go and I go,” Macomber added. Last year Macomber made headlines by jumping off the 45th floor of the Four Seasons hotel in Denver. He hovered around the edges of the roof and lived to tell the tale. His flight in China was a bit less dramatic, but his mission in China may not be over yet. “One of my biggest dreams is to fly over the Great Wall,” Macomber reportedly said. There’s no word yet if he’ll be able to fulfill that dream before he leaves China. Regular jetpack flights have almost become routine for people like Macomber, who use the technology most commonly for marketing purposes. Need a gimmick for your next trade show? Then Macomber is your man. Despite the fact that jetpack demonstrations date back to the 1960s, they have yet to prove themselves as a viable personal transportation device. Again, the incredible amount of fuel needed to lift a human being is one of the many obstacles. But don’t even get us started on the safety considerations. Despite assurances from other jetpack companies that the technology will be commercially available within the next two years, consider us skeptical. The future is here, but it’s a future where the jetpack is still little more than a toy. Granted, it’s a damn cool toy that can only be used by professional stuntmen. But it’s still a toy.